Giuseppe Marasco is mesmerised by a contemporary rendering of the ancient Greek myth of Orpheus and Eurydice, set in an east London cemetery. 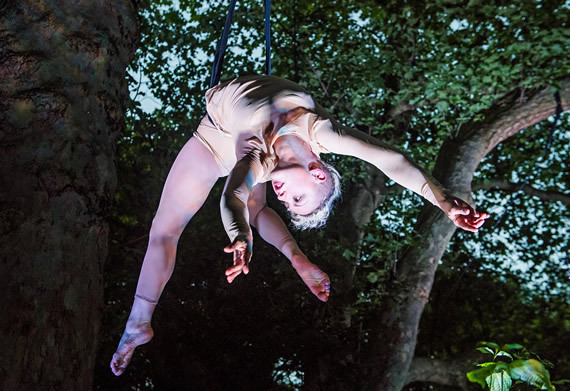 The internationally renowned Circus company Circa brings the tragic story to life in an unusual but appropriate setting – Tower Hamlets Cemetery Park in Depart. As the audience is ushered, on the threshold of dusk, into the thick of the cemetery park, they are all – in an invocation of Orpheus’s mistake – wisely warned not to look back. Carefully treading a path, into the underworld, the darkness takes on a physical, spatial association. Subtly tapping into the otherworldly nature that comes alive in any theatrical space, the suspension of social difference and identity, coupled with the proximity to performers, fascinates and unnerves. A Shade, the name of the underworld’s denizens, in this case a playful, mischievous sprite, shoots through, randomly abducting members of the public, as they work their way down the paths. Emotional and dramatic truth is conveyed, unfettered by clumsy narratives, we feel that we have witnessed a great many lives, re-enacting their pasts, trying to recover … their desires … or the inability to reconcile and make peace with life. 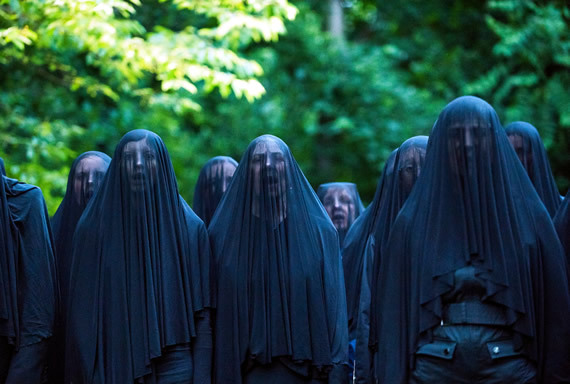 Electronic musician Lapalux and an uncanny, veiled cappella choir provide an aural atmosphere. We wrestle with who they are and that they touch the emotional barrier between the fictive and a real confrontation with our own death. As the audience moves through the park, different scenarios play out – lovers separated and hoped for reuniting, the burnt passion of unrequited love or crimes of passion or simply the yearning for the full spring of life. At times the spirits appear like creatures of the underworld, fairy-like or having changed in their nature over centuries of anguish. High up in the trees, trapeze and rope artists fly, or make shapes moving up and down on convectional currents of the will, as though in different levels of the underworld. Then, the movement suddenly halts. The figures pause, all animation gone, and they hang – echoing in eternity, dangling, lynched, suicides, victims of torture or simply catatonic. It’s an incredibly rich experience, where you find yourself stopping and looking back just as Orpheus did, at risk of losing your group, until a guide hushedly beckons you. A death-defying Chinese pole duo swing in, out, and between each other. There are precisely-timed falls, one moving his head or his body as the other falls down the pole, to miss by a hair’s breadth. They are syncopated — worryingly like doppelgangers — one seems to be the double of the other, an echo or his own desires unwilling to be unbound from the soul, a clone of a will still clinging on to the soul, or a more sinister entity suffocating and influencing. The performance suggests that the dead are no wiser than the living … they simply can not give up. There are extraordinary expressions of flight, paralleling a celebration and a close as possible realize from the limitations of the physical form. Lives seem like extraordinary and rare dancing flames. You sense the fragility and the vitality necessary to keep form, as a performer trembling, supports their colleague standing on their shoulders. Their movement embodies reverberations of life, cycles, patterns, gestures and the sheer pleasure of people watching. It’s an evening out filled with wonder and reflection as all your senses become engaged. The pubic may have to be generous and make allowances for speed which they pass through each performance. Yet I felt this added to the sense of loss and fugitive quality of the night. Of necessity, there had to be an improvised and broad brush strategy in place. Throughout, I felt like disregarding the organisers’ warning, to turn back and return to Depart. I’m eager to see how and where the show will reappear.